Vipers are all snakes that are part of the Viperidae family and are found in almost all parts of the world. There are some exceptions, such as Antarctica and New Zealand, where there are no snakes. One of the most interesting viper snake facts is that these snakes aren’t found in Australia. 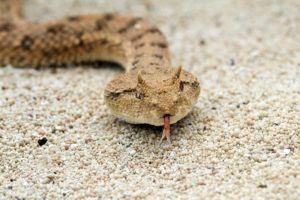 Every viper you come across is a venomous snake, and deadly toxins are injected from a single viper bite. When you’re first introduced to these creatures, you need to realize that these snakes demand respect due to their deadly nature. All viper snakes have fangs and are venomous. The physical characteristics of a viper snake vary greatly from type to type, so it’s hard to pinpoint an exact description to better help people understand what a viper snake looks like. If you consider the Mao-Lan viper, it’s under 2-feet long and was discovered just a few short years ago. 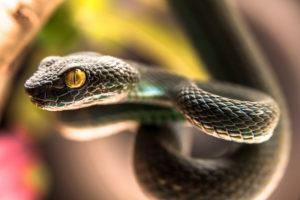 Scientists have yet to discover every snake in the world and even classify them all. 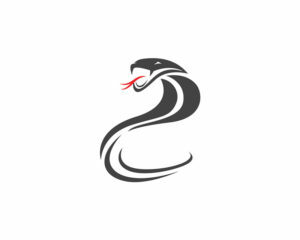 It’s an interesting turn of events, and it is one that makes our viper education an ongoing event. But the longest viper in the world is 11-feet in length and is the South American Bushmaster, so sizes vary greatly among this species. The one thing that will help you determine if a snake is a viper snake is its head. When viewing the snake in question, look at the head and make note of how it looks. Venom glands make this triangular shape happen in the snake’s head. What’s really neat and an interesting viper snake fact is that some snakes have evolved to have this triangular shape despite the snake not being a viper. Well, the snakes like to intimidate other snakes and protect themselves through a form of mimicking. The triangular head acts as a warning to other snakes and animals that they’re dealing with a potential deadly predator that has venom that’s so deadly, it can end in their demise. The issue is that even with all of these facts at your disposal, you should never get close enough to a snake for it to be able to bite you. The best advice I can give you is that if you don’t know what type of snake you’ve encountered, just stay away from it. Leave the classification up to the scientists. But if you’re in a zoo or you happen to snap a picture of a snake, these few pointers can help you better understand what snake it is that you’re identifying. What I really like about viper snakes is that they are filled with awesome facts that lead to their allure and mystique. 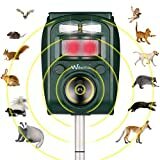 I am not saying I would ever wanrt to come close to one in the wild without the proper protection, but I definitely love learning about this deadly predator. I find it particularly interesting that the viper has a rotatable set of fangs, but you never want to be struck by a viper. While the fangs look like mere teeth to you, they’re attached to the venom glands of the snake, which sit behind its eyes. The venom gland is in the back upper part of the jaw, allowing the venom to fill into the hollow teeth and be injected into their victims. Rotation of the fangs is almost magical to witness, and the reason for this is that the fangs can rotate all at one time or independently. The snake has complete control over its fangs, so they have a control over their teeth that humans only wish they had. Imagine how easy it would be to clean your teeth if they rotated! Fangs can stay hidden for as long as the snake wishes, and then when it strikes, they will erect their fangs and can cause death if they want. Vipers can unhinge their jaws, so they’re able to open to a near 180-degree level. Fangs aren’t always out and ready to kill; they’re often folded up and sit against the roof of the snake’s mouth. Since the fangs are folded, they can grow rather long, and the 180-degree opening of the jaw allows the fangs to be used despite their long length. But perhaps the most interesting fact of all is that not all vipers decide to release their venom. Even the longest fangs are under full control of the snake. 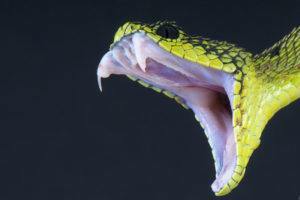 When a viper strikes, it can strike with a dry bite, which releases no venom at all. The viper doesn’t have an endless supply of venom, so if it’s attacking without the intent to kill, it can choose to use a dry bite instead of injecting venom. Thos natural defense mechanism serves the purpose of allowing the snake to conserve its venom for future use. 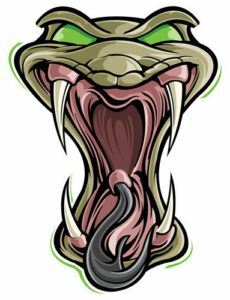 While the venom will replenish, the replenishing process will take quite some time to complete, and the snake is more vulnerable at this time. Snakes don’t want to be vulnerable, so there is a slim chance that they may decide a dry bite is within their best interest. But I wouldn’t chance being bitten by one of these snakes. Ouch. Vipers are mostly nocturnal, and the sluggish viper may seem to be a little slow at first sight. They’re fast snakes, but they prefer to use their camouflage to avoid danger rather than moving quickly like other snakes. Many other types of snakes will be slithering away into the waterways or going through brush to avoid danger. Not the viper. This docile ground-dwelling snake still has its large hinged fangs, and while the snake may move slowly on the floor as a tactic of avoidance, it can strike within a split second. Agile and deadly, the viper can often strike before a human has a chance to know what’s happened. A puff adder, which is part of the viper family, can move faster than any human alive. The time it takes these snakes to strike is just a quarter of a second. 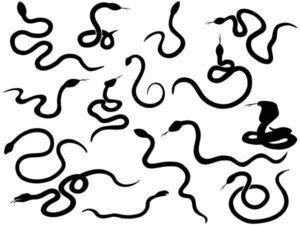 You wouldn’t have the time to get the signal to your brain to move fast enough to get away from one of these snakes. While it’s downright scary, it’s amazing to think just how fast these snakes can be. And a lot of the reason behind this sluggish appearance has to do with the behavior of the snake. You’ll find that vipers can be found in tropical forests, and they can be found in rainforests, deserts and even in the mountains. In fact, vipers are pretty much worldwide, and they can live in a variety of regions, but the extent of their resilience will vary from one species to the next. No matter where these snakes go, they will try to blend in with their surroundings to not be seen. It’s not that the viper is a lazy snake. The reason for the snake blending in with its surroundings has everything to do with the way it hunts. Hunting is the key to survival. A viper needs to eat, and if the viper wants to capture its prey, it will need to do one of two things: be aggressive or ambush its prey. Can you guess which option the viper snake has chosen through its evolution? Ambush. See, the viper is a master of disguise because it’s how the snake will find its next meal. Snakes will be able to sense the chemicals let off by their prey, so once they know their prey is around, the snake will just sit and wait for the kill. The viper melds into the surroundings so well that its prey practically falls into its jaws. Vipers use very little energy due to this method of hunting, so they can afford to wait for their prey. Small mammals are a great meal for the viper, and they will allow the viper to go quite some time without eating. A new study has shown that vipers have a hunting activity called prey relocation. Vipers like to stay out of harm’s way, so when they strike, they inject venom and immediately withdraw, allowing the prey to get away and die on its own. The snake will use its acute senses to smell for the dead prey and eat it once it has wandered off and dies. 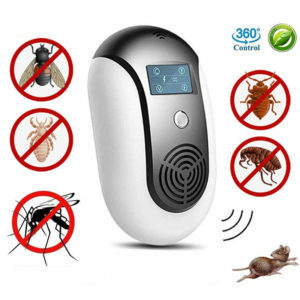 This allows for the lowest level of conflict and offers great protection to the viper. Scientists don’t know the natural lifespan of a viper because there are too many variables at play to know with 100% certainty how long these snakes will live. But a general estimate for the lifespan of a viper is 12 – 16 years. You can expect a viper to live longer in captivity. Vipers give live birth, so the eggs are incubated inside of the mother viper. What’s very interesting is that the Bushmaster viper has evolved to lay eggs, and this changes everything we know about the viper. The number of offspring varies from species to species, and the exact mating season will depend on the region of the world where the viper snake lives. Since there are so many species of vipers, you can imagine that each species has a different bite. The common European viper isn’t particularly deadly, but it does contain venom. The venom of this snake is moderate, and while unpleasant, this doesn’t mean it’s highly lethal. But if you traverse to the continent of Africa, you’ll come across gaboon vipers, which have a very potent venom that is very deadly. When attacked by a viper, it’s essential to seek out treatment. You never know if you have venom coursing through your veins or not. 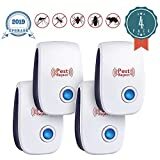 You may have gotten lucky and a dry bite occurred, but I wouldn’t risk my life on a slim chance of a passing snake being nice and caring for my life. 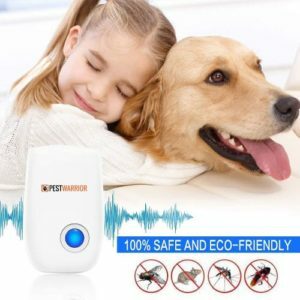 Medical attention is a necessity for all bites. Your tissue will start to decay due to the cell death. Did I forget to mention that the venom is also an anticoagulant? A person’s blood pressure will become erratic, and it will eventually collapse, leading to death. 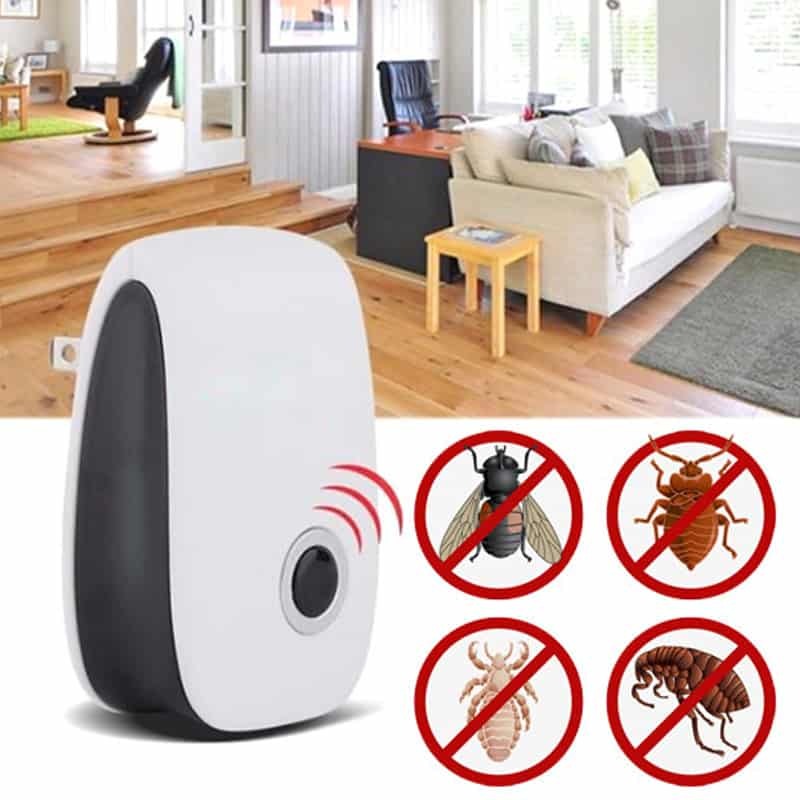 If you don’t want to die, you need to seek medical attention and get an antivenin as soon as possible. Since these snakes have to eat their victims whole, they rely on their venom to break down some of the victim’s cells, lipids and proteins, so you’ll be under immense pain and at a very high risk of death if you fail to seek some form of treatment – and quick. Over collecting is the biggest issue forcing the decline of the viper snake. Gaboon viper bites are serious because gaboon viper venom is very potent. An adult gaboon viper can easily kill a human or any prey that comes its way. The gaboon are the largest vipers in the world, and they claim their fame by having fangs that are 2 inches in length. Just imagine the pain of the neurotoxic venom accompanied by a 2″ hole in your arm or leg. These snakes eat mostly small mammals, but they have been seen eating giant rats and even small antelopes – scary. 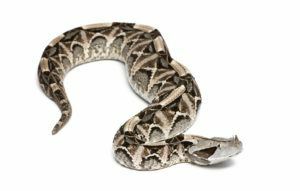 If you see a single gaboon viper during your life, you’ll want to run the other way and stay far away from their deadly, long fangs. 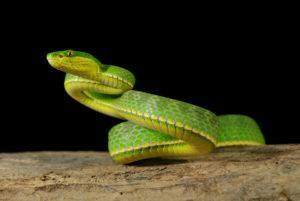 Pit vipers have 190 species, and they are distinguished by their pit organ on either side of their face. These vipers can be found in Asia, Europe and the Americas, and the only vipers in the Americas are the pit vipers. The pit organ acts as a receptor, and this is used to detect the heat of other animals. While the pit gland can sense heat energy, it can also sense cold blooded prey, too. Think of this defining gland as an additional way for the pit viper to view the world. Pits sense body temperature. Green viper snakes go by many names, and they get their name because of their green coloring (duh). This snake is beautiful, and the most popular of its kind lives in India and Southeast Asia. Vibrant in color, these snakes are a bright green color and have yellow eyes. When you see this snake in person, you can tell a male from a female by looking for a white stripe running down the sides of the body. 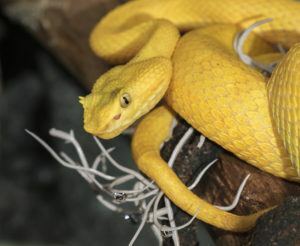 Green vipers have jaws that are yellow or white. Horned vipers have horn-shaped scales that you’ll find on their face. But there are numerous snakes that have this same characteristic, so it’s difficult to distinguish one horned viper from the next. You’ll find that there are Middle Eastern horned vipers, Saharan horned vipers and even nose-horned vipers. The nose-horned viper is very interesting because this snake has a horn on top of its nose. Some of the snakes will even have a horn over their eyes, and as a human seeing these snakes for the first time, it’s natural to be fearful. The nose-horned viper lives in Europe and Asia while all other species of horned viper are found in the Middle East or Africa. Horns are made from scales. An interesting tidbit is that some of these vipers can give birth to horned and non-horned snakes. Scientists still don’t know why these snakes have developed horns, but it may be to make it more difficult to see the snake. The eyelash viper is a small snake that is found in Central and South America. These small vipers have a bright coloration that is green or yellow or a mix of both. They have scales above their eyes that give this snake the appearance of eyelashes. These small snakes have such a unique array of colors because they will use their color to mix in with banana bunches and can be found slithering across flowers. Small yet poisonous, these snakes span just 2 feet in length. Science also doesn’t know why this snake has developed eyelashes, but some scientists think it may have something to do with the snake moving through thick vegetation. The eyelashes may actually protect the eyes, but no one knows for sure. These viper snake facts are all fun and interesting, so the next time you see a viper snake in a zoo (I hope), you’ll know that these deadly predators can also come in beautiful colors, can choose to inject you with venom and rather be left alone than bothered.